There has been surfing in western Washington since the 1960s. 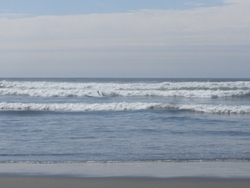 Originally surfing began in off Point Grenville, in the Quinault Indian Reservation. 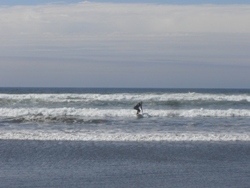 Then the surfing moved down the coast to Westport, Washington. 5 Math and surfing…? Oh yes! Don’t buy the gear until you’ve tried it more then once. You might not enjoy it as much as you think, and gear can be expensive. When buying your first board, go big. Larger boards provide more stability. A 8' to 9’6’’ would be most ideal. Also, talk with people who know about the specifics in a board, they are not all the same. Surfing in Washington means a wetsuit. These can be bought used or new and come in different thicknesses for different conditions. Again, talk with people before you but it. •	Alcohol: Surfing when drinking is not a good idea, you can endanger yourself and others. Don’t do it. •	Be Aware: Always be aware of other surfers and water users, of the surf conditions, and of where you are surfing. •	Comfort Zone: You should surf in waves that you are comfortable with. Never let yourself or anyone else get you into a situation you’re not comfortable in. •	Fitness: Make sure you are physically fit when surfing. You need to be able to swim back to shore through the oceans swells if you lose your board at the end of an exhausting session. •	Food: As with swimming, do not go surfing for at least 45 minutes after a meal. And have plenty of food and drink waiting for you when you get out of the water. •	Fun: Surfing is all about having fun; keep it in mind when you are out in the waves. •	Hold or Throw: Know when to hold on to your surfboard and when to get rid of it. If you are paddling out, then keep hold of your board. You'll get back to the line up more quickly, and you'll not put anyone paddling out behind you at risk. If you are about to wipe out, get rid of your board. You are far more likely to sustain an injury if you and your board are getting washed around together. •	Patrolled Beaches: If you are surfing on a patrolled beach, make sure that you keep within the designated surfing area. Take note of where you should be surfing before you go out, and make sure you stick to it when you are out. •	Priority: Always make sure that you are not taking anyone else's wave. Remember that the surfer who is closest to the breaking wave has priority. If you see someone already on a wave, then the wave is considered to be taken, and you'll have to wait for the next one. •	Practice: If you want to improve then you need to be in the water surfing as regularly as possible. •	Respect: Respect the locals if you are visiting a beach. Remember that you are a guest and that waves should be shared. •	Rips: If you are caught in a rip, remember that it's called R.I.P. for a reason. You may not make it back to dry land ever again if you get caught in one. Hopefully you already know that a rip is a strong current that (normally) goes straight out to sea and, if caught in one, you should not panic but instead paddle across the rip (not against it) until you have escaped. •	Sun Block: Always wear a good waterproof sun block. You will burn in even the cloudiest of days, and it will hurt. Also, if you are not wearing a wet suit, it is a good idea to wear a UV-proof long sleeve rash vest for body protection. •	Surf Buddy: Always surf with at least one other person. Not only will you have more fun if you are sharing your waves, but you'll always have someone to help you out if you need it. •	Surf Conditions: Make sure that the surf is safe before you go in. If you are going surfing at a spot you are unfamiliar with it, is a good idea to get some advice from a local. Check out the surf spot while warming up. The following is an explanation of how to learn to surf from "Beginner “How to surf” series: How to surf a wave in 3 hours"
"First get out on the water. That is 80% of the effort. Everyone has their lazy days, so get surf buddies. Then get on a board and paddle out. To get out through the waves paddle straight into the wave (not at an angle which could flip you). You must be in a minimum depth of 1 meter of water to catch a wave, so paddle out. Wait until a wave has just passed then spin you board around, you don’t want to be caught side on and flipped. So now you’re lying on the board pointing towards the shore, with waves running you down from behind. When you spot a wave that is radical enough for you, start paddling approximately 2-5 meters in front of it. Paddle like MAD! And keep paddling even as the wave is taking you. The first time you ride a wave you can just let it happen and body board it into the shore, then you can build up the confidence to catch a wave. There are two methods of standing up, ’standard’ and ‘Knee up.’ To stand up Standard lie on the board, flat on your stomach and in the centre, your feet should just be touching the ‘tail’ of the board. The board should be balanced on the water, use your hips and body to keep the board balanced. The nose should be raised just a few inches out of the water. Adjust your weight forwards and backwards to lift the nose just a fraction out the water. Not too much, not too little: about 1-2 inches. Start paddling again and once you’re riding the wave, grip the edges of the board with white knuckles of determination. And do a pushup but keep your hips on the board. (For you yoga buffs this is the cobra position, which you can practice anywhere, anytime). Drag one foot fluidly (that means in one movement) and plant it in the centre of the board 90 degrees to the direction of travel. Using your back leg just to balance put all your weight into the front foot and push up. You should aim to place your feet on the board like you do in rounder’s (cricket, baseball, softball etc). Both feet should be 90 degrees (pointing just a little bit towards the front) to the direction of travel and evenly spaced apart, and right on the centre line of the board. You can practice the ‘pop up’ and stance on the beach. Just lay your board flat on the sand and pretend you are on the water. Imagine the paddle out, pop up and then adjust your stance. Keep your knees slightly bent tai chi style, but only as far apart as is comfortable. Most of important of all make sure your feet are on the centre line. If you don’t mind looking like a newbie (and there is nothing wrong with that) you can even draw a black permanent line down the centre of your board, and as you practice the pop up check to see if your feet are perfectly placed on the line. 99% of post popup bails (so you get up but you always bail) are due to feet not properly on the centre line. If the standard method just doesn’t work for you try the knee up technique. Paddle out, catch the wave, and instead of moving 1 leg forwards move both legs into a kneeling position. Then grip the rails of the board and slide one foot up so the knee is up against your chest, and then slowly raise your self into a crouching position. If you follow these instructions you WILL learn how to surf, within 3 hours of reaching the beach." •	Weather: can be unpredictable, if weather turns bad, get out of the water. Can cause immediate changes in the patter of the waves, increased wind can cause waves to change size and choppiness. •	The waves (size and shape): large waves can be very dangerous. Do not put yourself in a citation that you’re not experienced to handle. Hollow waves are more dangerous than crumbling waves. Hollow waves are formed when the bottom goes from deep to shallow very quickly. Hollow waves also break very strongly, and wipeouts are usually more extreme. Crumbling waves occur when the bottom has more of a gradual slope. 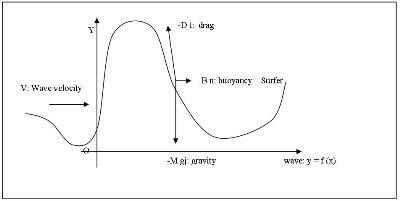 This allows the wave more time to unload its energy, and thus results in a slower, weaker wave. Slower, crumbling waves are ideal for beginners. One cubic foot of water weighs about 62 pounds. That means a cubic yard of water weighs about 1684 pounds. Math and surfing…? Oh yes! Did you know that there is a mathematical equation for riding the ocean's waves? That’s right, there is. This magical math is reported in the Society for Industrial and Applies Mathematics, by Takeshi Sugimoto in “How to Ride a Wave: Mechanics of Surfing.” If you have tried to take a ride on the water, the reason that it is so, so, very difficult is because it is only – only - possible to hitch a ride on a wave if you catch it at the “lower part of the front side of a concave surface of a wave.” This precise form of riding is used by human's, and their inventions (like boats), and by animals like dolphins. So now if you head out to the water, you can think not only of the glory of the ride, but the mathmatical and splendor behind it!Enjoy! 1) Sugimoto, Takeshi. How to Ride a Wave: Mechanics of Surfing. Society for Industrial and Applied Mathematics. SIAM Review, Vol. 40, No. 2 (Jun., 1998), pp. 341-343. 4) McQuaide, Mike. Riding the waves at Westport, Washington’s own Surf city. The Seattle Times. Travel/Outdoors. June 16. 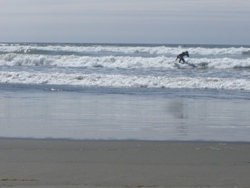 2008. http://seattletimes.nwsource.com/html/outdoors/2003061241_nwwsurfing15.html. 4.26.2010. This page was last modified on 21 May 2010, at 16:34.